Optimal working dilutions should be determined experimentally by the investigator. Suggested starting dilutions are as follows: WB (1:500-1:2000), IHC-P (1:50-1:300), ELISA (1:10000-1:20000). Not yet tested in other applications. Fig.1. 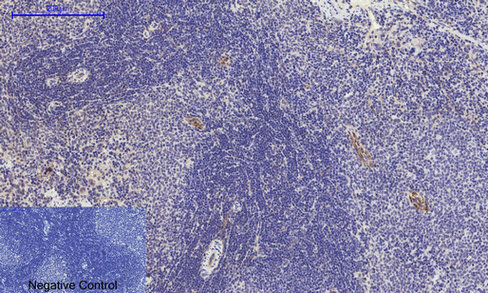 Immunohistochemical analysis of paraffin-embedded Human-uterus tissue. 1, Tau Polyclonal antibody was diluted at 1:200 (4°C,overnight). 2, Sodium citrate pH 6.0 was used for antibody retrieval (>98°C,20min). 3,Secondary antibody was diluted at 1:200 (room tempeRature, 30min). Negative control was used by secondary antibody only. Fig.2. 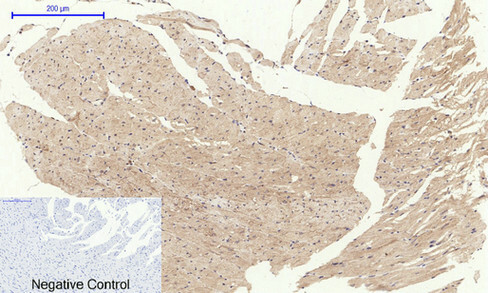 Immunohistochemical analysis of paraffin-embedded Rat-heart tissue. 1, Tau Polyclonal antibody was diluted at 1:200 (4°C,overnight). 2, Sodium citrate pH 6.0 was used for antibody retrieval (>98°C,20min). 3,Secondary antibody was diluted at 1:200 (room tempeRature, 30min). Negative control was used by secondary antibody only. Fig.3. 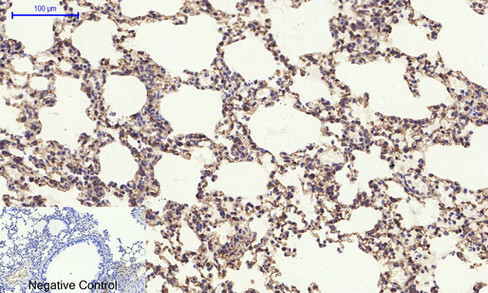 Immunohistochemical analysis of paraffin-embedded Rat-lung tissue. 1, Tau Polyclonal antibody was diluted at 1:200 (4°C,overnight). 2, Sodium citrate pH 6.0 was used for antibody retrieval (>98°C,20min). 3,Secondary antibody was diluted at 1:200 (room tempeRature, 30min). Negative control was used by secondary antibody only. Fig.4. 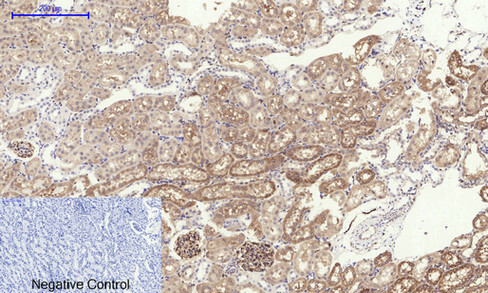 Immunohistochemical analysis of paraffin-embedded Rat-kidney tissue. 1, Tau Polyclonal antibody was diluted at 1:200 (4°C,overnight). 2, Sodium citrate pH 6.0 was used for antibody retrieval (>98°C,20min). 3,Secondary antibody was diluted at 1:200 (room tempeRature, 30min). Negative control was used by secondary antibody only. Fig.5. 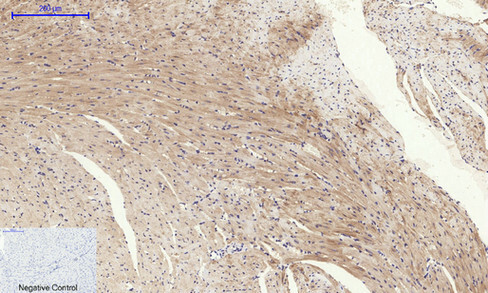 Immunohistochemical analysis of paraffin-embedded Rat-spleen tissue. 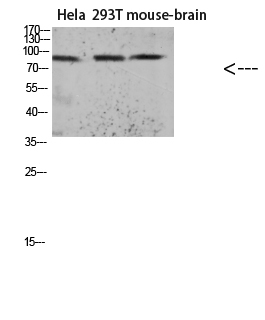 1, Tau Polyclonal antibody was diluted at 1:200 (4°C,overnight). 2, Sodium citrate pH 6.0 was used for antibody retrieval (>98°C,20min). 3,Secondary antibody was diluted at 1:200 (room tempeRature, 30min). Negative control was used by secondary antibody only. Fig.6. 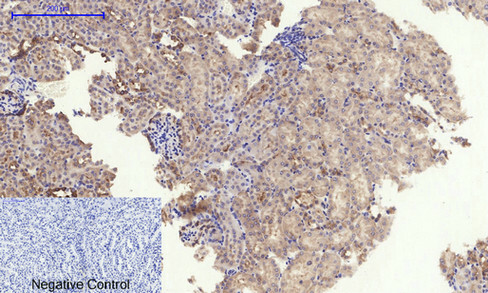 Immunohistochemical analysis of paraffin-embedded Mouse-heart tissue. 1, Tau Polyclonal antibody was diluted at 1:200 (4°C,overnight). 2, Sodium citrate pH 6.0 was used for antibody retrieval (>98°C,20min). 3,Secondary antibody was diluted at 1:200 (room tempeRature, 30min). Negative control was used by secondary antibody only. Fig.7. 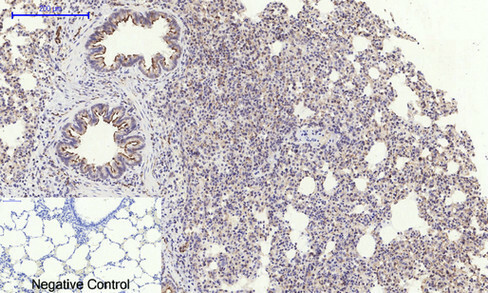 Immunohistochemical analysis of paraffin-embedded Mouse-lung tissue. 1, Tau Polyclonal antibody was diluted at 1:200 (4°C,overnight). 2, Sodium citrate pH 6.0 was used for antibody retrieval (>98°C,20min). 3,Secondary antibody was diluted at 1:200 (room tempeRature, 30min). Negative control was used by secondary antibody only. Fig.8. .Immunohistochemical analysis of paraffin-embedded Mouse-kidney tissue. 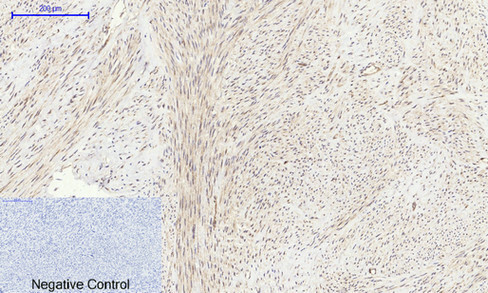 1, Tau Polyclonal antibody was diluted at 1:200 (4°C,overnight). 2, Sodium citrate pH 6.0 was used for antibody retrieval (>98°C,20min). 3,Secondary antibody was diluted at 1:200 (room tempeRature, 30min). Negative control was used by secondary antibody only. Tau encodes the microtubule-associated protein tau (MAPT) whose transcript undergoes complex, regulated alternative splicing, giving rise to several mRNA species. MAPT transcripts are differentially expressed in the nervous system, depending on stage of neuronal maturation and neuron type. MAPT gene mutations have been associated with several neurodegenerative disorders such as Alzheimer's disease, Pick's disease, frontotemporal dementia, cortico-basal degeneration and progressive supranuclear palsy. MAPT (Microtubule Associated Protein Tau) is a Protein Coding gene. Diseases associated with MAPT include Pick Disease and Supranuclear Palsy, Progressive. Among its related pathways are Alzheimers Disease Pathway and Reelin signaling pathway.